Ladders provide kids with some of the best parade views. (CNN) -- It has been called "The Greatest Free Show on Earth." 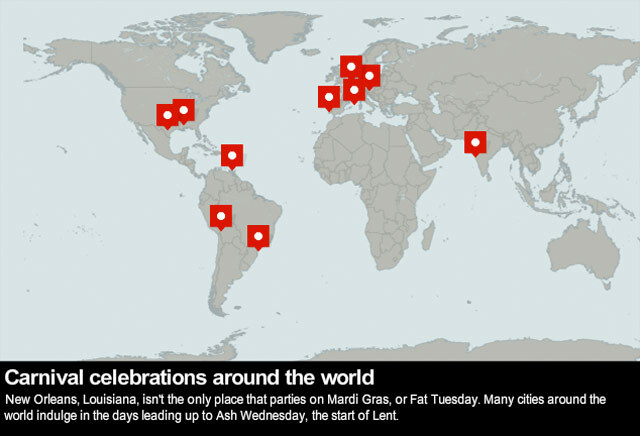 The New Orleans, Louisiana, Mardi Gras is a celebration of culture, food, music and family. But for many adults, Mardi Gras conjures up images of drunken excess, exposed body parts and general unruly behavior -- all that on top of nowhere to use the bathroom. The raunchy stuff is contained mostly to a single stretch of the French Quarter, Bourbon Street. That's the place network TV and webcams focus on, from the safety of a balcony. Let's face it, it's a great picture. But that is only a slice of the party. 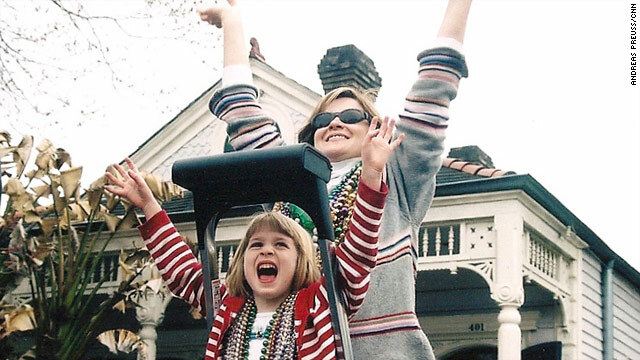 It's been said often, especially to me: "Why would you want to take your kids to Mardi Gras?" Well, I am proud to say my kids have been just about every year of their lives, and it is their favorite time to visit their mom and dad's hometown. There's nothing better than seeing your child wide-eyed at the spectacle as colorful floats, marching bands and dancers roll by. If you're driving, be prepared for traffic jams near parade routes. Local radio stations give parade progress reports but even if you can get near the route, parking can be an issue. And parking enforcement officers are out with tow trucks and citation booklets. Don't block driveways or park too close to the corner. There are also a lot of one-way streets that can get confusing. The best way to get to parades can be to ride a bike, take a streetcar or walk. The New Orleans Police Department and other local departments provide some of the best crowd control in the world. Officers are stationed on just about every street corner along the popular parade routes. They are kid friendly. If you are coming from out of town, explain the ground rules to the kids. Introduce them to a police officer on your corner. It might also be prudent to give them a note card with phone numbers and lodging address, just in case they get lost. Don't get too close to the floats, their wheels can be dangerous. This is especially important to remember as your kids get the feel of the crowd and become more daring. Some hotels and organizations set up stands along the parade routes. These are ticketed affairs, usually including food and drink. But one of the best ways for kids to see the parades is on top of a ladder. Residents get pretty creative with their makeshift ladders -- most are painted and decorated in the traditional purple, green and gold. There is a safety bar to hold the small kids in place, along with the ever-present adult on the rungs. You will see these lined up by the hundreds along the parade routes. Locals are very proud to show off their kid ladder and will ask whether your kid wants to partake. Take them up on the offer. Remember this key phrase: "Throw me something!" After yelling this, kids will literally get bombarded by the masked riders, sometimes to the point of pain. If you aren't looking, a hard round string of plastic pearls can hurt. So always be cognizant of where the throws are coming from and try to keep as much field of vision as you can. Bring a large bag to carry your Mardi Gras treasures. Make sure your kids say "thank you" to the riders. I know they really appreciate it. Along some routes there are portable toilets, but they can be smelly and gross. A better bet would be to locate a church or school along the route that is offering pay-one-price toilet access. You get a wristband and can use their facilities all day and night. You can also use business bathrooms, but that is usually after making a purchase. Your kids may see, hear or smell things that can be quite shocking. That's part of the celebration. I've always found that if my kids and I run across something risqué, I'm prepared to have the discussion about how some people can be different but it's all part of the fun. I've also used some observations as teaching moments. For instance, "Is that person lying down drunk in the street really having a good time?" Mardi Gras is the great equalizer. All types of people from every racial, social and economic level are gathered in the streets. They all want the same thing: fun, food and plenty of beads. Your kids can take part in this distinctive celebration, and with common sense, planning and a lot of yelling "throw me something," you and your kids will connect with fun times.